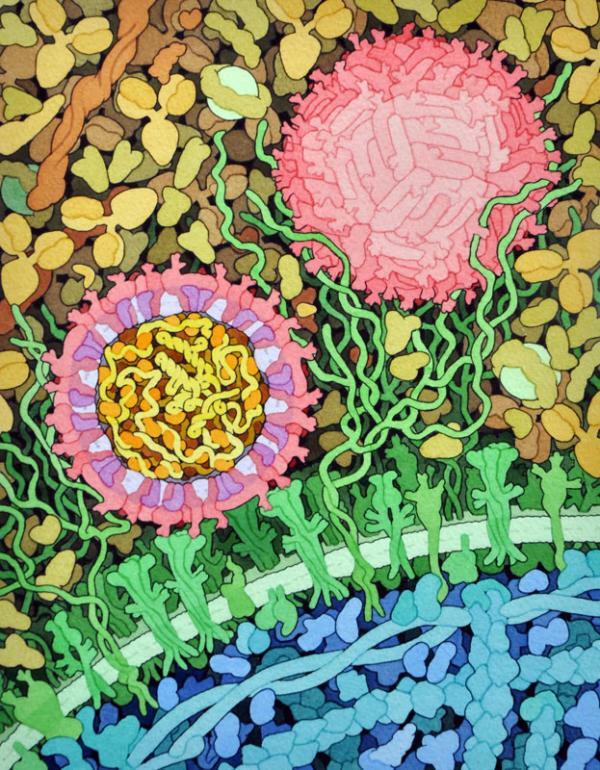 At the 2017 Vizzies, David Goodsell's painting was recognized by the National Science Foundation (NSF) and Popular Science as one of the best science images of the year and selected as the "People's Choice" in the category of illustration. Created for the Molecule of the Month feature on Zika Virus, the image also appeared on the cover of Wing Beats and Cell Host & Microbe, and inspired other PDB-101 materials available for download, including Zika paper models and a coloring book. Zika virus is shown in cross section at center left. On the outside, it includes envelope protein (red) and membrane protein (magenta) embedded in a lipid membrane (light purple). Inside, the RNA genome (yellow) is associated with capsid proteins (orange). The viruses are shown interacting with receptors on the cell surface (green) and are surrounded by blood plasma molecules at the top.